Movie review of “Spotlight”: Tom McCarthy’s mesmerizing new film stars marquee-name actors — Michael Keaton, Rachel McAdams, Mark Ruffalo — as drab journalists on the trail of an explosive scandal in the Catholic Church. 4 stars out of 4. What matters here are the steps along the way to an explosive series published in early 2002: the interviews, the filling out of forms at the courthouse, the microfiche, the phone calls, the knocking on doors — and, finally, all the pieces assembled. (McCarthy can’t resist the cliché shot of newspapers rolling off the presses, but he’s earned it.) “Spotlight” is paced like a thriller — you’ll be surprised by how much tension McCarthy can wring from a scene involving a bored courthouse clerk — and you feel that ticking clock throughout. There are, we’re reminded, no shortcuts; the work takes as long as it takes. ‘Spotlight,’ with Mark Ruffalo, Michael Keaton, Rachel McAdams, Liev Schreiber, John Slattery, Stanley Tucci, Brian d’Arcy James, Billy Crudup. Directed by Tom McCarthy, from a screenplay by McCarthy and Josh Singer. 128 minutes. Rated R for some language including sexual references. Meridian, Lincoln Square. This is one of those rare movies that’s a true ensemble piece: Though Michael Keaton plays the leader of the Spotlight team, writer/editor Walter “Robby” Robinson, it’s a murderers’-row lineup of equals. 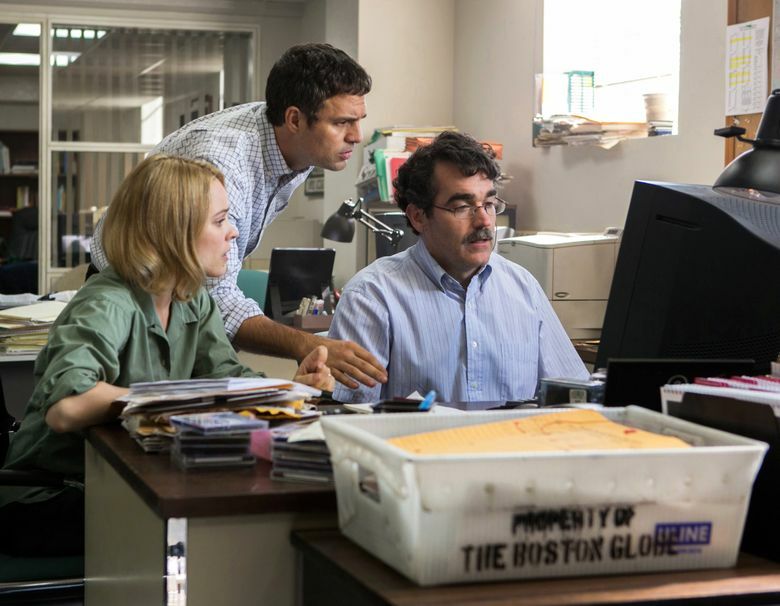 Ruffalo gets the film’s one showy, sputtering monologue (and hits it out of the park); Rachel McAdams plays the nose-to-the-grindstone reporter Sacha Pfeiffer; Brian d’Arcy James is researcher Matt Carroll; John Slattery plays deputy managing editor Ben Bradlee; Liev Schreiber is their just-arrived boss, executive editor Marty Baron. All, in their newsroom-drab khakis and button-downs, are uncannily and unshowily good, particularly the delicate way McAdams gently but doggedly coaxes victims to tell their stories, and how Slattery quietly conveys Bradlee’s dual feelings about the story (it’s important, yes, but the Church — and the Globe’s predominantly Catholic readership — won’t like it). Outside the building, Stanley Tucci and Billy Crudup are equally terrific as a pair of very different attorneys: one exasperated, one cagey. Though “Spotlight” is definitely a reporter-as-hero story (and, along the way, a bittersweet love letter to the kind of investigative journalism that’s increasingly disappearing), the film doesn’t let its characters off the hook. The story should have been told earlier than it was, and they know it. But these very unglamorous, real-seeming people, wandering through the sometimes grubby labyrinth of the building where stories have been told for decades, are just doing their jobs as best they can. As is McCarthy — and, like them, he succeeds brilliantly.